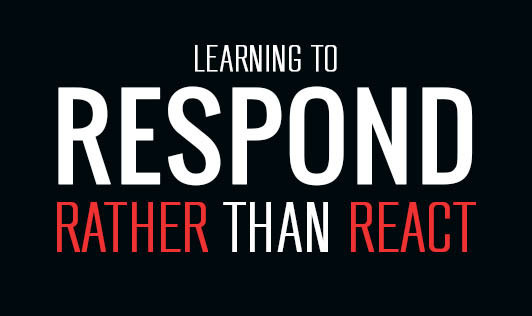 Learning to Respond rather than React. Reactions are done on impulse, without putting much thought into it or considering what the end result may be.Whereas, response is more thoughtful and done with reasoning. People who respond put their thoughts ahead of their actions. Responding, is the best way to deal with situations because when one tends to reason, they begin to see the event from their opponent’s point of view. One can learn to respond rather than react. Let’s start by understanding, what do people who respond, rather than react, do differently? Most of the time, the answer to this question is 'No'. In fact if you can fix it, it really isn’t a big deal. And if it simply cannot be fixed, there is no use fretting over it. Of course, you would feel bad losing it, but your worry will not make it return. Remember, that this will hardly matter in the long run. In most cases, no. Most of these events happen by accident and unless you have been lifelong enemies with someone, you can be certain that it is not a deliberate act. Is it Worth Ruining a Relationship Over This? No; definitely not. Your anger will not do any good. And the person you react to may not easily forgive. By being angry, you will only be inviting strain into the relationship which might even cause it to break off. It is not worthy losing a loved one or friend over something so trivial. Space. Just walk away. Engage yourself in some other activity and let the other person be. During this time, replay the situation, and ask yourself the 3 questions mentioned above. Compassion. Analyze first and then reply. Go over the situation from the other person’s point of view. And when you respond, treat the other person the way you would want to be treated. Tone. Use a mild tone. Don’t be loud or brash. A milder response will help you get your point across effectively and leave a positive impact on the other person. Let go. Don’t cling on to a problem once you have dealt with it. If it’s done, it’s done. Clinging on to it will only cause you to recap it in your head, leading to more pain. What to do when you react? Apologize. Apologize immediately if you have reacted rudely and feel bad about it. Forgive. This applies for you as well. Forgive yourself for what you have done and move on. Actions cannot be reversed but they can serve as useful lessons for the future.